It’s that time of year again, where Pedro and all his Amigos at America’s #1 roadside tourist attraction, South of the Border in Dillon, SC, get ready for the holiday season. As you and the family rush around trying to get that perfect present for the special ones in your lives, don’t forget that South of the Border is a gift shopping mecca. That’s right, South of the Border for holiday shopping! We can make your holiday shopping easy, exciting and extraordinary. Our gifts can range from silly to superior and cost 50 cents to $5,000. The Christmas and holiday season is most represented and displayed at our Antique Shop. During the holiday season we go all out to create a festive winter season atmosphere with Christmas decorations adorning the walls, halls, furniture and even Pedro himself. We stock the shelves with seasonal wreaths, Santa Claus dolls, Christmas trees, pretty lights, amusing toys and all manner decorations for Christmas trees and the home. The Antique shop is also filled to the brim with antique furniture, old timey signs, country curios, beer company memorabilia, cute teddy bears, cuddly dolls, collectible figurines, fine china, decorative paintings, home accessories, woven rugs and even more. The Silver Slipper also plays host to a flea market every weekend, where a variety of vendors set up their own booths filled with anything and everything under the sun. If you are just passing through South of the Border on your journey and find something you like, we can arrange to have the item shipped to your doorstep whenever and wherever you request. The Antique Shop is now located in the enormous Silver Slipper building located on the north side of complex next to the Exxon gas station and El Drug Store near the Interstate 95 and Highway 501 intersection. All kids love a new toy and you can make that sleigh ride to Grandma’s house go by a lot faster with some of our travel games and toys meant to be played with in the car. No more answering the “Are we there yet?” questions is definitely priceless. You can find them scattered throughout the various shops like El Drug Store and the Mexico Shop. 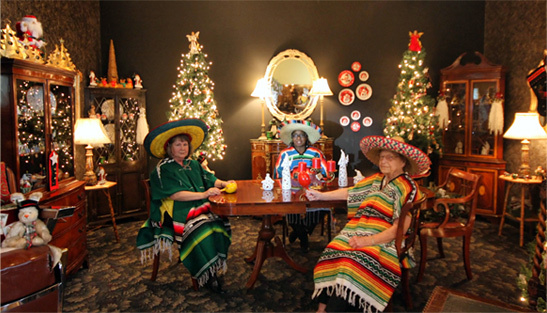 The Mexico Shop, our biggest store, also has row upon row of trinkets, treasures and South of the Border branded memorabilia for your crazy friends with a great sense of humor or the ones who love to collect funky baubles. Our Hats Around the World store has a wide variety of ball caps, cowboy hats, visors, sombreros and other chapeaus with an international flair to keep your head warm on the cold winter nights. The international theme continues in the Africa Shop, where uncommon and dramatic artifacts from all over the world’s largest continent are on display. 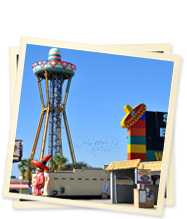 So be sure to explore our selection of gift shops whether you’re just stopping by for a brief visit to fill up the automobile and grab a bite to eat, or you’re coming to South of the Border to spend a couple days sight-seeing and shopping.